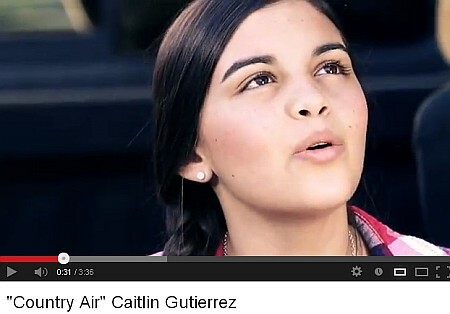 Dunwoody Food Truck Thursday welcomes 15 yr old DHS Caitlin Gutierrez & some great food. This Thursday at Brook Run Park will be amazing with local talent and wonderful food. We have artist Caitlin Gutierrez performing, a new dessert truck Chay J's New Orleans Candies, LLC and we will be selling beer! Chay J's New Orleans Candies, LLC. A decorative wheel competition full of family fun, treats and awards for top contestants! Dunwoody, GA – July 19, 2013 – The City of Dunwoody Department of Parks and Recreation celebrates the grand opening of Phase I of the Brook Run Park multi-use trail with a “Wheel-a-Palooza and Pedal Parade.” The special grand opening event and parade begins at 10:00 a.m. at the Brook Run Park trail entrance, between the playground and skate park, on Saturday, August 3, and includes a bike/vehicle decorating contest judged by local celebrities. This roll and stroll event celebrates the grand opening of the 0.7 mile “Phase I” section of the Brook Run multi-use trail with an extraordinary parade competition followed by prizes, giveaways and tempting frozen treats provided by King of Pops. The decorative wheel parade and contest is open to both children and adults and distinctive trophies will be awarded in select categories for the top non-motorized decorated wheeled vehicles. Children ages 12 and under are invited to decorate their bike, wagons, scooters, or wheelchairs to compete for the top prize in the following children’s categories: Most Colorful; Most Creative, and; Best Theme. Teens and adults can also join in the competitive vehicle decoration and one award for the Most Creative entry in this age group will go out to one lucky participant. The decorative wheel competition is free to enter and participants within both age groups must register on-site or by emailing parks@dunwoodyga.gov prior to the event. Entry in the decorative wheel competition is not mandatory to be part of the parade but all drivers and riders of wheeled vehicles are required to wear bike and safety helmets. An adult must accompany children participants. 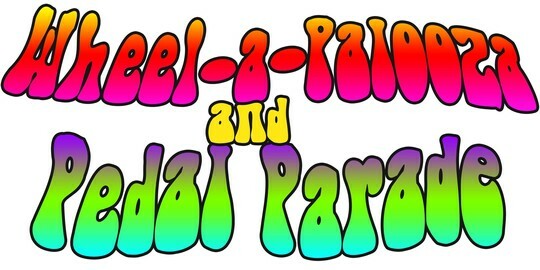 “Wheel-a-Palooza and Pedal Parade” competition event participants should gather in the pre-event corral area between the Brook Run playground and skate park at 10:00 a.m. Contest winners will be announced at the close of the parade and all first place category contestants will receive a distinctive trophy. Following the parade, official judging and award ceremonies participants can cool down with a delicious frozen gourmet popsicle and celebrate with friends and family. The three-quarter mile “Phase I” section of the Brook Run multi-use trail will eventually connect with Phase II, a one mile, 12-foot wide multi-use concrete trail which will complete an approximate 2 mile loop within the park. The City is currently in the final design stage for Phase II of the trail and anticipated trail construction is planned to begin in the fall. For more information, rules and a details schedule of events please visit the City website at www.dunwoodyga.gov or contact Edie Damann, Marketing and PR Manager, at 678-382-6712 or edie.damann@dunwoodyga.gov. After a long summer of interviews and coaching searches, we have hired two incredible coaches to work with our basketball program. I am happy to say that although both of the coaches had a very late start this summer, they are well on their way to building a strong program. We welcome Coach Angela Nash as our Girls Varsity Basketball Coach and veteran Math teacher. In addition we welcome Coach Kevin Dankosky as our Boys Varsity Basketball Coach and veteran Special Education teacher. Both of the coaches come with a wealth of knowledge and talent on the court and in the classroom. They will be a great addition to the Wildcat staff. Below you will find a short bio on each coach. Angela Nash has been an educator and basketball coach for 25 years. She is the proud mother of Kristin Nash, a former Dunwoody Wildcat who now attends Shorter University and is a member of the women's basketball team. Coach Nash is a bona fide Wildcat, as she has worked and coached for Dunwoody High School for 15 years. Following a brief experience in the county in other areas, she has returned home. It was at Dunwoody High School Coach Nash earned over 200 wins, 8 trips to the state play-offs, two region championships, two runner up championships, two sweet-sixteen playoff berths and an elite 8 appearance. Coach Nash is a mathematics instructor and her philosophy about working with athletes is that they are students first and athletes second; getting it done on and off the court, true Wildcat style. She is excited to be home. Coach Kevin Dankosky has been coaching high school basketball in Atlanta for over twenty years. Prior to coming to Dunwoody, he managed the rebuilding of the South Forsyth Basketball program and helped turn Milton into a perennial State Finalist and national power. Coach "D" also spent several seasons as Ron Bell's assistant at Marist including a State Championship in 2000. Over his career, Coach Dankosky has coached over 50 players who have gone on to play in college and/or professionally. In addition to coaching, his basketball background includes scouting for the Lakers which led to him being a finalist for an assistant coach position under Pat Riley with the New York Knicks at just 21 years old. business and broadcasting world including twenty plus years at WSB radio where he served as a sports reporter, talk show host and managed the Clark Howard show. For many years he was a columnist for SCORE ATL and even had a real acting role in the movie "Remember the Titans". In the classroom, Coach Dankosky has been teaching Special Ed for the past five years. Last year at South Forsyth he was runner up for Teacher of the Year and was appointed the school's Spirit Director. when they look back at the time they spent in our program." "I want our players to dream big and then let us help them reach those dreams." "Nothing worthwhile is ever easy to get." 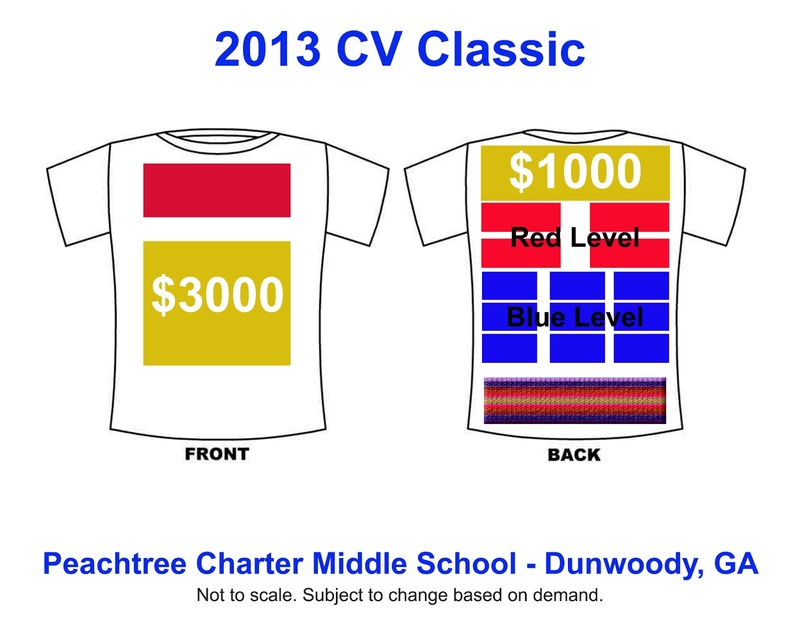 A better Dunwoody Blog - focusing on Dunwoody's tomorrow. New Blog For Our Community..focusing on the positive in Dunwoody - and there is a lot of positive to talk about!! Click here for "A Better Dunwoody" Facebook page. 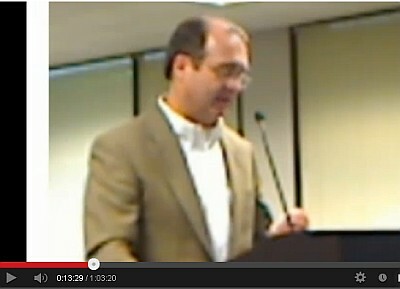 Click here for "A Better Dunwoody" Blog. The Peachtree Charter Middle School family eagerly awaits the arrival of the students for the 2013-2014 school year. The upcoming Summer Bridge program events are special for our rising 6th graders. 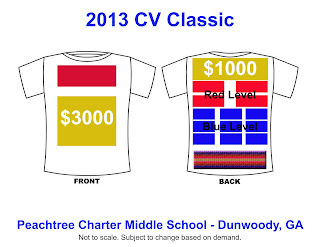 On Thursday, August 1, 2013, from 8:00 AM - 12:00 PM, sixth grade parents and students arrive to register in the gym. Two different types of proof of residency (current mortgage deed or lease, June or July gas or electric bill, NO phone or cable bills). Please bring 2 photocopies of each document that will be kept by the school. Current immunization form that shows proof of two MMR, two Varicella, and three Hepatitis B vaccines; one photo copy required. At Registration, you will complete the PTCC registration form and Charter Agreement. Agenda planners, PCMS spirit wear and PE uniforms will be available for purchase.Payment by checks and cash will help PCMS save on credit charge fees. After registering and purchasing required items, students will receive their class schedule for the first semester. Also, any student interested in joining the PCMS band may stop by the band room for a brief instrument evaluation. On Friday, August 2, 2013, from 8:00 AM - 12:00 PM, parents are to drop off their sixth grade students promptly at the main entrance. They will be greeted immediately. Students only will attend an orientation program consisting of various sessions such as: meet and greet social, what to expect on the first day of school, dress code expectations, appropriate use of lockers, clubs and organizations, Candy Get-to-Know-You ice breaker game, scavenger hunt throughout the building, mock schedule class rotations, etc. The purpose of the scavenger hunt is for students to locate rooms or areas, such as the nurse's office, the counseling office, the media center, classrooms, etc. Please have your child wear rubber bottom shoes, such as sneakers, because the scavenger hunt requires students to walk up and down stairs. Also, each student needs to bring a pen or a pencil. 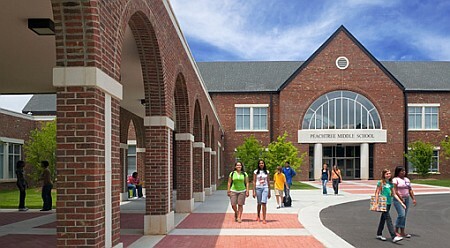 Parents' Meeting will be in the cafeteria from 11:30 AM - 12:00 PM, prior to student pick-up, to learn about PCMS. There will be a welcome from PTCC and Question and Answers about PCMS. Thank you very much for participating in the Summer Bridge program. Mark your calendars! 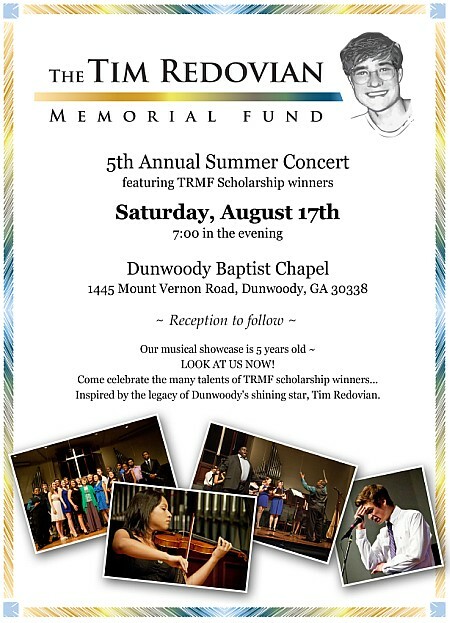 The Fifth Annual Summer Concert to benefit the Tim Redovian Memorial Fund will be presented Saturday, August 17th at Dunwoody Baptist Church. The show begins at 7pm in the DBC Chapel, 1445 Mt Vernon Rd Dunwoody, GA 30338. Admission is free; TRMF donations will be accepted. 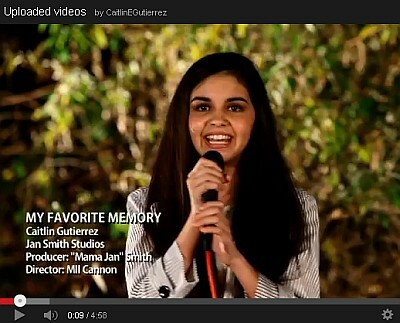 Past recipients of TRMF scholarships will showcase their musical talents in "Look At Us Now!" created especially for this anniversary performance, and staged for the first time on a Saturday night. A reception will follow the show. TRMF is a 501(c)3 non-profit organization established in memory of Tim Redovian, a gifted young performer who lost his life to a rare respiratory illness in 1996. 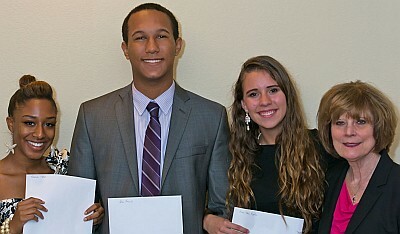 TRMF provides funding and scholarship awards to talented high school students pursuing education in the performing arts. For more information, visit www.timredovian.org. Paths make it possible for Perimeter Center drivers to walk to lunch. Since The Atlanta Journal-Constitution moved its headquarters to Dunwoody three years ago, I’ve joined the roughly 120,000 Atlantans who commute into Perimeter Center. We are a diverse bunch who arrive daily by bus, bike and train, but mostly by car. We pull our microchip-coded IDs from the lanyards around our necks to raise the mechanical arms into our parking lots. We look for shaded spots in summer and close-in spots during rainstorms. We work for a few hours before deciding it’s time for lunch. Some of us brown bag it and some look no further than the company cafeteria. But the rest of us who like to consider the scores of nearby options have an uneasy choice: drive or walk. This dilemma is faced by anyone who works in a so-called “edge city” — a collection of office parks and shopping malls that initially were laid out with only mechanical conveyance in mind. A growing number would like to walk, because it is the better choice. Better for the environment and better for personal health. When the day is sandwiched by two highway commutes, the thought of not having to get into a car appeals. Yet those of us who’ve tried to find the walking paths through edge cities know the drawbacks. There may be few sidewalks on our route. The sidewalks, when they exist, often offer no shade or environmental protection. Most restaurants are offset from the street inside strip shopping centers. To get there, you’ll have to walk through deep parking lots, no fun during Atlanta’s sticky-tar summers. Then there’s the issue of The Mall. Is Perimeter Mall the life-giving nucleus of the neighborhood or the energy-sucking black hole? That depends whether or not you like walking through the Nordstrom shoe department and the food court on your way to a restaurant. We’re a club! Walk the streets of the Perimeter area at lunchtime and you will find other like-minded souls outfitted in loose cotton clothing and soft-soled shoes. Unofficial walking paths abound. If you see a hedge of bushes alongside a parking lot, you will find a break for the cut-through. Small nature trails hide in plain sight. If you find a small stand of trees, there will be a path running through it. There are no easy or attractive ways to walk around Perimeter Mall. The best way forward is through. After this experience, I began walking everywhere, trying to find the shortcuts and the “good” sidewalks where I could pass under shade trees and perhaps hear a songbird or two. But I wanted to hear what the professionals had to say. So I called up the Dunwoody city planning office and asked if anyone would be interested in going for a walk with me. A small posse from that office joins me one morning at Alon’s in the Park Place shopping center, and off we go. Where I see typical mall-periphery scenery, they see potential. This particular lot lies in an existing entitlement zone. It is zoned for a hotel, fitness center and restaurant space — one that will open its door right to the sidewalk should a deal ever get cut. Other such entitlement zones ring Perimeter Mall, though no major development has happened since the beginning of the recession in 2007. Our walk takes us past a street that has been put on a “road diet” to add a bike lane and a sidewalk widened so two people can walk abreast. 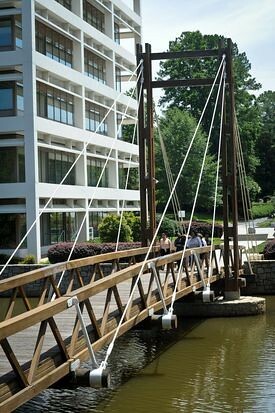 Then we walk through Terraces, the office park, on a path that leads us on a bridge over a pond. Once marketed for its seclusion, Terraces now attracts new tenants because of its walkability. Follow the path and it soon dumps you on the edge of Perimeter Place, a retail development with a number of low-price dining options. There’s no crosswalk and no sidewalk to greet you, but you’re there — a quick asphalt hop away from lunch. As one sign of success, Starling points to the new location of intown favorite Tin Lizzy’s Cantina. The restaurant chose to retrofit the ground floor of a SunTrust bank branch, and its patio spills a welcome energy onto a street corner that has begun to feel more pedestrian-friendly. Likewise, the newly reflagged Le Méridien Hotel has opened Portico, a restaurant that hopes to draw locals for business lunches during the day and craft cocktails at night. But the message to newcomers so far seems to be this: Drive. No sidewalk or walking path connects the secluded, wooded setting of the hotel to the massive shopping mall, right across the street. Wanna know the back way in? Look for the stand of trees between Terraces and Le Méridien. Follow it to the small stream that has a well-trod footpath running alongside. It’s a lovely walk, filled with chirping birds, that will eventually deposit you at the back of the hotel, right by the employees’ entrance. It’s a nice way to spend your lunch hour. Tin Lizzy’s Cantina: 121 Perimeter Center West, Atlanta. 470-514-1050, tinlizzyscantina.com. Portico: 111 Perimeter Center West, Atlanta. 770-396-6800, lemeridienatlantaperimeter.com. Nordstrom Cafe: 4390 Ashford Dunwoody Road, Atlanta. 770-394-1141, nordstrom.com. Chuy’s: 118 Perimeter Center West, Atlanta. 770-351-7777, chuys.com. Alon’s: 4505 Ashford Dunwoody Road, Atlanta. 678-397-1782, alons.com. McKendrick’s Steak House: 4505 Ashford Dunwoody Road, Atlanta. 770-512-8888, mckendricks.com. Dunwoody News: Wheel-A-Palooza, Tree Care Seminar, Sunday Cycle and More! Come help us celebrate the grand opening of Phase I of the Brook Run Park multi-use trail! The Wheel-a-Palooza and Pedal Parade begins at 10:00 a.m. at the Brook Run Park trail entrance, between the playground and skate park, on Saturday, August 3, and includes a decorated bike/vehicle contest judged by local celebrities. Register for the contest by sending your name, age, and type of vehicle to parks@dunwoodyga.gov. You do not have to participate in the contest to join in the parade. Children ages 12 and under are invited to decorate their bike, wagons, scooters, or wheelchairs. Teens and adults can also join in the competitive vehicle decoration contest. Register today! Following the parade participants can cool down with a delicious frozen gourmet popsicle from King of Pops and celebrate with friends and family! City Arborist Howard Koontz will take participants through the basics of planting and caring for trees. The seminar begins at 6 p.m. and will held at the Dunwoody Nature Center. The Dunwoody Charter Commission Meeting will begin at 7 p.m. at 47 Perimeter Center East, Suite #400, Conference Center. This foodie event, complete with live music, takes place from 6 p.m. - 9 p.m. and features a variety of new and different offerings each week. For more details contact Bettie Cagle, event manager at bettie@redbirdeventsatl.com or (404) 754-3211. The Zoning Board of Appeals will hold a meeting beginning at 7 p.m. at Dunwoody City Hall, 41 Perimeter Center East, Suite 103. Click here for the meeting agenda. Join your friends and family for a community bike ride for all ages and abilities! This community ride takes place on the first Sunday of each month. Meet in front of Bruster's in the Dunwoody Village at 2:30pm. Helmets are required. 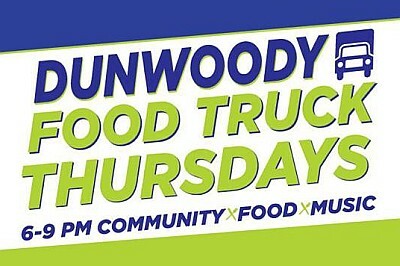 Event Coming Soon to Dunwoody! Join the Dunwoody Police Department at the Perimeter Target the evening of August 6, beginning at 6p.m. Meet the officers, get a first hand look at a patrol car and the new SWAT vehicle! Attendees will also enjoy food, music, and other presentations by the DeKalb Fire Department. The event is Free and open to all. National Night Out (NNO) is a unique crime/drug prevention event sponsored by the National Association of Town Watch (NATW) www.nationalnighout.org/nno/. The Southeast Homeschool Expo is town this weekend at the Cobb Galleria. It's a 10-15 minute drive from Dunwoody. Lots of resources for homeschooling. Even if you do not homeschool you can go and look at books and curriculum to enhance your child's education. Perhaps your child acquires knowledge in a way not taught at the public school. Maybe you want more religious and conservative resources at home. It's all there. See HERE. Lots of corporate and independent vendors on site. All items passed as presented except the alcohol in parks item which failed. 300 trees will be planted in city parks including a possible expansion of the orchard in Brook Run. Three candidates (Jim Riticher, Henly Shelton and Sam Eads) announced during public comment for the Nov City Council elections as a slate naming themselves as the "clean sweep candidates" see video at the 12 min mark for announcement. Alcohol in parks item is discussed at the 23:30 point above and was rejected unanimously. 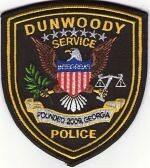 Dunwoody Police Crime Response Team is ready for your requests. The Crime Response Team was formed in May of 2013 as part of the Dunwoody Police Patrol Division to provide the Department with the ability to quickly address emerging crime trends and problem areas. The CRT allows the Department to direct resources to a specific problem without diverting Patrol officers from responding to calls for service. The overriding philosophy of the CRT is that crime can be deterred from occurring through highly proactive enforcement and through directed enforcement following creative problem oriented policing strategies. The Crime Response Team consists of three patrol officers and one sergeant working in a variety of marked and unmarked vehicles, bicycle patrol and foot patrol - depending upon the specific problem they are addressing. The Traffic Complaint Form is designed to provide citizens the opportunity to alert the Dunwoody Police Department to potential traffic hazards in their neighborhood or a particular location within the City. Such complaints might be drivers repeatedly disobeying a stop sign at an intersection, drivers failing to slow down in school zones, or drivers routinely speeding at a particular location. If you have observed a potential traffic hazard and would like the Dunwoody Police Department's Crime Response Team to look into it, please use our ONLINE TRAFFIC COMPLAINT FORM to notify us. The use of a speed trailer aids in educating the public. Especially the driver who may be unaware of exactly how fast they are going. While traffic enforcement through visible patrols and traffic citations remains an important component of our overall traffic safety strategy, the use of our speed monitoring trailer bolsters our efforts to reduce speeding through education and awareness. Residents who would like the speed monitoring trailer placed in their neighborhood are invited to use our ONLINE SPEED TRAILER REQUEST FORM to notify us. Due to the high volume of requests for the speed montoring trailer, placements will occur in the order in which requests are received. For speed trailer results reporting, visit our SPEED TRAILER PAGE. The Dunwoody Police Department utilizes state of the art technology to receive information on criminal activity including potential drug "hot spots", crimes against persons or property, and other important information to help resolve or deter criminal activity within our community. Specific information such as addresses, detailed suspect descriptions, makes, models, colors, license plates and special features of vehicles as well as any other pertinent information can be helpful to the Department when investigating tips and complaints. Visit our Submit A Crime Tip page for access to our text or online tools. If your employer (and those of you who own/operate a local business) wants to participate please email dunwoodyparent@gmail.com to secure your spot. The event is October 5th, 2013 but sponsorships are being secured now. Exciting Programs… Open to the Entire Community! All classes are Monday-Friday, 9:00 am-3:30 pm and will include a lunch break. Driver's Ed classes are designed to produce safer, more confident, and more experienced teenage drivers. Each student will attend 30 hours of classroom training, which includes the State-required Alcohol and Drug Awareness (ADAP) training. Students will also complete 6 hours of private individual behind-the-wheel training with a licensed driver training instructor. Graduates are eligible for up to 10% reduction in insurance premiums and parents are eligible for a $150 Georgia Income Tax Credit. All students must be at least fifteen years of age by the end of the class. More information: Stacie Graff, stacie.graff@atlantajcc.org,678.812.3972. Edgewise is a weekly speaker series that touches on a multitude of relevant topics from politics and religion to Hollywood to history. Adults of all ages are invited to join the discussion. On August 1, Miki Bell, who served in the Israeli Police Force and Army and worked for El-Al, will speak about her book A Life of Many Colors: From Israel to America. More information: Lilly Mahana, lilly.mahana@atlantajcc.org,678.812.4064. Beat the heat and join us for an indoor tournament at the MJCCA! This tournament is perfect for players of all ages and skill levels. In addition to a great day of friendly pickleball competition, all registered players are welcome to take advantage of all MJCCA facilities for the day. Players registered as singles will be paired with other unmatched players. Tournament will consist of 2 groupings (recreational and competitive, with prizes awarded to the winner of each grouping). Players are guaranteed a minimum of three games in their grouping. The top teams in each grouping will advance finals and a chance to play for the championship. Prizes will be awarded to the 1st place team in each grouping. Advanced registration required. Fee includes: Tournament entry, one-day MJCCA facilities pass, drinks, snacks, and prizes for the winners. Edgewise is a weekly speaker series that touches on a multitude of relevant topics from politics and religion to Hollywood to history. Adults of all ages are invited to join the discussion. On august 8, Seymour E. Goodman, Professor of International Affairs and Computing at Georgia Tech, will discuss cyber security and provide an overview of why we are all at risk and how much of it is beyond our control. Under the guidance of award-winning and best-selling writer Lisa Shore, this course lets writers between the ages of 13 and 16 unleash their creativity while gaining important knowledge about the tools of the trade like voice and story. These emerging authors will gain an education on the different types of fiction and non-fiction. This provides them the opportunity to discover which genre they like best. Fun and pressure-free, students will foster valuable writing skills to help them become stronger writers – a skill they’ll need in school and beyond! About the Instructor: Lisa Baron Shore is an award-winning writer and author of the acclaimed political memoir: Life of the Party. Lisa has appeared on MSNBC's "The Martin Bashir Show"; "The Dennis Miller Show"; "The Alan Colmes Show"; "Culture Shocks"; "On the Block with Tim"; "The Judith Regan Show"' and participated in Vanity Fair's exclusive Writer's Reading series. More information: Pam Morton, pam.morton@atlantajcc.org, 678.812.3981. Join us for BBYO Connect's Kickoff Pool Party! Teens will enjoy fun in the sun, pool games, and snacks to end the summer and start off the school year. You do not need to be a member to attend! Approval of Contract Award to Trees Atlanta Agreement for Tree Plantings Within the City Parks. Approval of Project Agreement with the Georgia Department of Transportation for Perimeter Center Traffic System Upgrades. RESOLUTION: To Establish Print Fees for GIS Maps. Approval of Contract Award for RFP 13-02 Public Safety Video Surveillance Project. SECOND READ: Ordinance to Amend Chapter 25, Section 25-32: Possession, Use, or Consumption of Alcoholic Beverages. RESOLUTION - 90 Day Moratorium on Rezoning and Special Land Use Permit Applications. Appointment of Member to Serve on the Dunwoody Audit Committee. RESOLUTION to Establish Fees for Life Safety Review and Inspection.